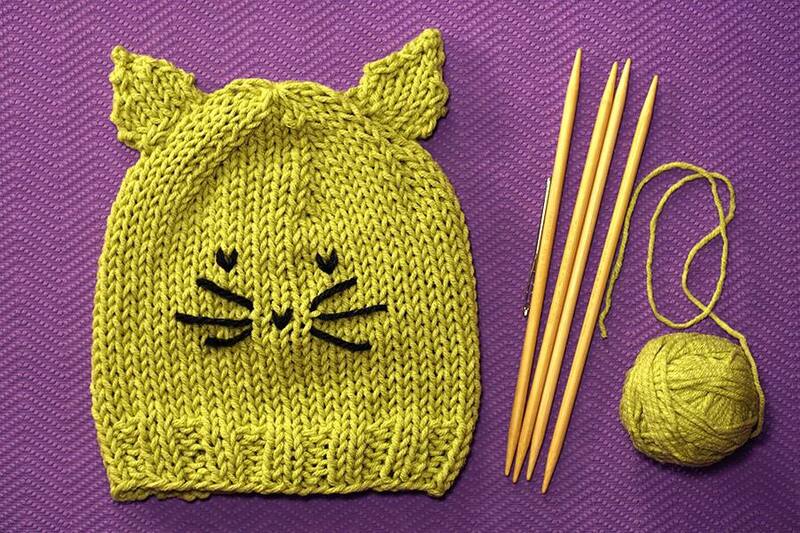 This cat hat is a really quick and easy pattern that's sure to be a hit with any cat or animal-loving child. This project is just a simple stockinette stitch hat worked in the round; the fun comes with the addition of simple triangular ears and stitched embellishments. Cast on 40 (44, 48, 56) stitches. Divide onto 3 double-pointed needles and join in the round. Place a stitch marker if desired to mark the end of the round. Work in knit 2, purl 2 ribbing for 1 inch. Work in Stockinette Stitch (knit every round) until piece measures 4 (4.5, 5, 5.5) inches from cast on edge. *Knit 6, knit 2 together. Repeat from * around. On the second size, knit 4 stitches at end of the round. 35 (35, 42, 49) stitches. *Knit 5, k2tog. Repeat from * around. 30 (30, 35, 42) stitches. *Knit 4, k2tog. Repeat from * around. 25 (25, 28, 35) stitches. *Knit 3, k2tog. Repeat from * around. 20 (20, 21, 28) stitches. *Knit 2, k2tog. Repeat from * around. 15 (15, 14, 21) stitches. *Knit 1, k2tog. Repeat from * around. 10 (10, 7, 14) stitches. Cut yarn and thread onto a yarn needle. Slip the remaining stitches onto the yarn and pull tight to close the top of the hat. Using two double-pointed needles but knitting back and forth, cast on 6 stitches. Slip, slip, knit, knit 2, knit 2 together (4 stitches). Once four ears have been completed, hold two ears wrong sides together and stitch around the edges. Repeat with remaining ears, then sew onto hat as shown or wherever you would like. Using a length of medium weight black yarn and a yarn needle, stitch eyes and a nose using a duplicate stitch. The whiskers are simply really long stitches worked on a slight diagonal. The center whisker is longer than the other two.